For the Irish activist, see Alice Brady (labour activist). For the character in The Brady Bunch seen in the middle of the 9 intro subscreens, see Alice Nelson. Alice Brady (born Mary Rose Brady; November 2, 1892 – October 28, 1939) was an American actress who began her career in the silent film era and survived the transition into talkies. She worked until six months before her death from cancer in 1939. Her films include My Man Godfrey (1936), in which she plays the flighty mother of Carole Lombard's character, and In Old Chicago (1937) for which she won the Academy Award for Best Supporting Actress. In 1960, Brady received a motion pictures star on the Hollywood Walk of Fame for her contributions to the film industry. Her star is located at 6201 Hollywood Boulevard. Mary Rose Brady was born in New York City. Her father, William A. Brady, was an important theatrical producer. Her mother, Rose Marie Rene, died in 1896. She was interested at an early age in becoming an actress. She first went on the stage when she was 14 and got her first job on Broadway in 1911 at the age of 18, in a show with which her father was associated. In 1913 she appeared with John Barrymore in A Thief for a Night (adapted by P. G. Wodehouse and playwright John Stapleton from Wodehouse's novel, A Gentleman of Leisure) at McVicker's Theatre in Chicago. She continued to perform on Broadway (often in shows her father produced) consistently for the next 22 years. In 1931 she appeared in the premiere of Eugene O'Neill's Mourning Becomes Electra. Her step-mother was actress Grace George (1879–1961), whom her father married when Alice was a child. Her half-brother was William A. Brady Jr, the son of her father and Grace George. 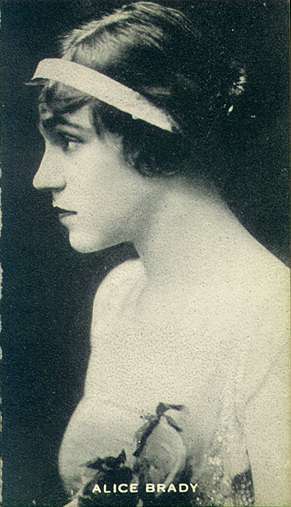 Brady's father moved into movie production and presentation in 1913, with his World Film Company, and Brady soon followed along after him, making her first silent feature appearance in As Ye Sow in 1914. She appeared in 53 films in the next 10 years, all while continuing to perform on stage, the film industry at the time being centered in New York. In 1923, she stopped appearing in films to concentrate on stage acting, and did not appear on the screen again until 1933, when she made the move to Hollywood and M-G-M's When Ladies Meet become her first talking picture. From then on she worked frequently until her death, making another 25 films in seven years. Her final film was Young Mr. Lincoln (1939). Brady was married to actor James Crane from 1919 to 1922, when they divorced. They co-starred in three silent films together: His Bridal Night (1919), Sinners (1920) and A Dark Lantern (1920). The couple had one child, Donald. Alice Brady died from cancer on October 28, 1939, five days before her 47th birthday. For her portrayal of Mrs. Molly O'Leary — a fictionalized version of Catherine O'Leary – in 1937's In Old Chicago, Brady won the Academy Award for Best Supporting Actress. She had been nominated for the same award the year before as well, for her work in My Man Godfrey. A long-enduring myth states that at the Academy Award presentation dinner, Brady's Oscar Award, a plaque (statuettes were not awarded for the Supporting categories until 1943) was stolen by a man who came onstage to accept the award on the absent actress's behalf and that it was never recovered, and the impostor was never tracked down. The Academy then issued a replacement plaque which was later presented to Brady. However, according to press at the time the film's director, Henry King, accepted on her behalf at the ceremony and friends of Ms. Brady delivered it to her home later that night. Winners are given blank awards at the ceremony and return them to the Academy to have them engraved afterwards. Miss Brady also followed this practice, which may have led to the story that the Academy was presenting her with a replacement trophy. ^ "Walk of Fame Stars-Alice Brady". Hollywood Chamber of Commerce/Walk of Fame. ^ Decherney, Peter (24 February 2016). "Stolen Oscars: History, Markets And Myths". Forbes. Retrieved 9 March 2017. Wikimedia Commons has media related to Alice Brady.